Brands: Aedes De Venustas, Amouage, Andy Tauer, Carner, Eight&Bob, Escentric Molecules, Etat Libre d'Orange, Frederic Malle, Heeley, Histoires de Parfums, J.F. Schwarzlose, Jul et Mad, Le Galion, Mark Buxton*, Nasomatto, Olfactive Studio, Ormonde Jayne, Parfums MDCI, Profumum, Roja Dove, The Different Company, The House of Oud*. There also used to be BLOOD Concept, S4P, Tom Ford Private Blend. Brands: ATELIER COLOGNE, Atkinsons*, Acqua di Parma, Armani Prive, Aerin, By Kilian, BOND NO. 9, Bella Bellissima, Comme des Garcons*, Cloon Keen Atelier*, Chanel Les Exclusifs (@Chanel boutique), Creed, Diptyque*, Eight&Bob*, Escentric Molecules, FREDERIC MALLE, Hermessence, Jo Malone, Laura Mercier, Maison Martin Margiela, MORESQUE, Memo, PHILIPPE STARCK, Roads, The Beautiful Mind Series, Tom Ford Private Blend. 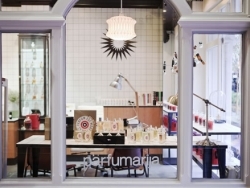 Brands (cosmetic area + Space NK' branch): Atelier Cologne**, Acqua di Parma, Alvarez Gomez, Bella Freud, Chantecaille, Comme des Garcons, Cire Trudon*, Creed, Diptyque*, ESCENTRIC MOLECULES, Geoffrey Beene, Juliette Has a Gun, Korres, Laura Mercier, Maison Francis Kurkdjian, Robert Piguet, Shay&Blue, Tom Daxon, This Works, Trish McEvoy, The Art of Shaving. Brands: Acqua di Parma, Creed, Jo Malone**, Kiehl's, Molton Brown, MAISON MARGIELA PARIS, Tom Ford Private Blend, THIERRY MUGLER Les Exceptions. Brands: Annick Goutal, Comme des Garcons, Jack Black, Serge Lutens**, Terry De Gunzberg, True Grace, Voluspa. Brands: Acqua di Parma, Bella Freud, Boadicea The Victorious*, Cire Trudon, Escentric Molecules, FORNASETTI, NOBLE ISLE, Neom, True Grace, TERRY DE GUNZBURG, THE DIFFERENT COMPANY*. Brands: Geo F Trumper, Truefitt&Hill, Taylor of Old Bond Street. Aer Rianta: 1st Terminal (Level 5 Main Terminal Building) and 2nd Terminal: Jo Malone. Terminal 1: Armani Prive, Chanel les Exclusifs, Kiehl's, Le Labo, Tom Ford Private Blend. Nue Blue Eriu at 7 South William Street and in Dublin Docklands (The CHQ Building).